This Chocolate Sour Cream Bundt Cake is one of my favorites. It’s not as dense as your typical pound cake, but rather soft and tender and almost reminds me of a cake-mix based cake. I mean that as a compliment. It has the tenderness and moisture of a cake mix cake but tastes like a scratch cake (no box taste). The sheen you see in the picture is my failure of a glaze. The glaze tasted good, but was too thin and I didn’t find it quite chocolaty enough. What you see on the cake is about a quarter of the yield. Most of it dripped onto the foil. Update: I used to combine sour cream with buttermilk when making this, but now I omit the buttermilk and use 1 cup of sour cream. If you are out of sour cream or for some reason have 1/2 cup sour cream and 1/2 cup buttermilk, you can use the buttermilk. Adapted from Cook's Illustrated, this is a moist chocolate cake that's simple and delicious. Because it is so rich you can skip the glaze and dust it with powdered sugar, but feel free to drizzle on your favorite chocolate glaze anyway! Preheat oven to 350 degrees F. Spray a 12 cup bundt pan with flour-added cooking spray or grease and flour thoroughly. Combine cocoa, chocolate, and espresso powder in medium heatproof bowl; pour boiling water over chocolate and whisk until smooth. Cool to room temperature; then whisk in sour cream (or combination of sour cream and buttermilk). In a second bowl, whisk together flour, salt, and baking soda. In a standing mixer fitted with paddle, beat butter, sugar, and vanilla on medium-high speed until pale and fluffy, about 3 minutes. Reduce speed to medium and add eggs one at a time, mixing about 30 seconds after each egg. By hand or using very lowest speed of mixer, stir 1/3 of the flour into batter. Add half of the chocolate/sour cream mixture and stir until incorporated. Scrape bowl and add remaining flour mixture and all of remaining chocolate mixture. Add chocolate chips if using. Pour batter into prepared Bundt pan. Bake until wooden skewer inserted into center comes out with few crumbs attached, 42-45 minutes. Cool in pan 10 minutes, then invert cake onto parchment-lined wire rack. Let cool completely and dust with confectioners' sugar if desired. If you don't have any flour added baking spray, you can use Cook's Illustrated's technique. They melt 1 tablespoons of butter (shortening works too), mix it with cocoa, then brush it all over the interior surface of the pan. I would like to make this cake for my grandson’s birthday. I would like your glaze recipe. It doesn’t have to be a thick glaze. Thanks for the review, Helen! I should have bumped this one up for Halloween. I guess I’ll go ahead and put it in a printable format. I just made this last night — it’s a wonderfully dense and moist cake with great chocolate flavor! This is great — thank you, Anna! Thanks for the tip, Anu! I will have to try that. I made an eggless version using tofu instead of eggs. It was delicious- the texture was in between a cake and a brownie. Loved it! I made this cake a couple of days ago with ingredients I had on hand (1 cup sour cream, no buttermilk, and no espresso powder). It was the BEST chocolate cake. So rich and good I didn’t even add a glaze. Thanks so much for the recipe! I’ll be making this one again. Anna, I was just thinking about this cake – I’d made it when the issue came out, and wanted to make it again last week, but could not remember which issue it was in. Now I can go dig it out of my basement “files” (actually, piles). I like the texture and moistness of this cake, and it wasn’t too sweet, if I remember correctly. Karen,When you make it, will you post a picture? I want to see yours. Annie, bundt cakes are addictive, aren’t they? I can see how this cake would have gotten you interested. Sandra, I think I get mine in the coffee aisle. I believe it’s in the instant coffee section. I buy it and it lasts for years! This is the cake that got my baking started. It is so good, and really easy. I bake all the time now and this is my standby chocolate cake, I even started changing the recipe a bit, a huge step for me. I have added orange extract and almond extract for something different. I made the cracker candy last night and it turned out great! I used margarine and it worked. 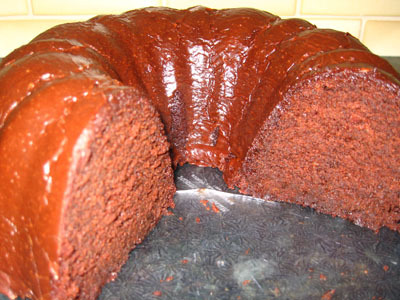 This cake, from the picture, reminds me texture-wise of a chocolate chip pound cake my mom makes! It’s the only chocolate cake I like. Claire, glad the cracker candy worked out. Next time I make it, I’m going to make the “Peabody” version. That is, with the Keebler Butter Crackers, white chocolate and cherries.tg, the film was just so darn ernest that I can’t slam it. It was an indepedent film about a little girl — that’s all I say. Hopefully, she and the rest of the cast have had acting lessons by now. please anna…don’t leave us hanging! what did you think?also, where do you find instant espresso powder? What no back story to go with the cake?? Why, what, when, where? ;-)Looks yummy!! Does it taste as great as it looks??? ?